This article addresses the most common activation errors. If you haven’t already followed the activation guide, we recommend you check it out first. 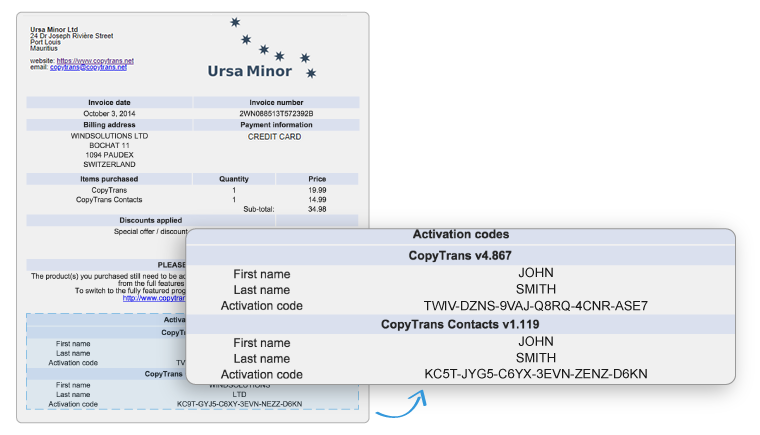 Your activation details are automatically displayed in your browser within 5 minutes after purchase. In addition, an email containing your activation details is sent within 15 minutes after your purchase. Our email does not always manage to get to your inbox because of your ISP/email spam filtering settings. Please, check your Spam/Junk folder. The activation code is for another product. This means you are trying to activate CopyTrans with your CopyTrans Contacts code or CopyTrans Photo with your CopyTrans TuneSwift code… You get the idea. The activation code you entered is too short/too long. Double-check the activation code for missing/extra characters. Your first name, last name or activation code code is mistyped. Please copy-paste the activation details you received into the respective activation fields. The activation code has expired. If you purchased some time ago, you may have an outdated activation code, use the license page to obtain an activation code for the latest version. The activation is no longer valid. When you receive a message “The code you entered is for another language” this means that you have purchased a license from one of our non-English online stores (i.e. the Spanish, French, German, or Japanese store). You’ve got a pop-up saying that the 2 years of updates that came with your purchase have now expired. But that can’t be right since you bought yesterday/month ago/a year ago. Don’t panic – your activation codes are still valid and you are eligible for free updates till the end of your two-year period. 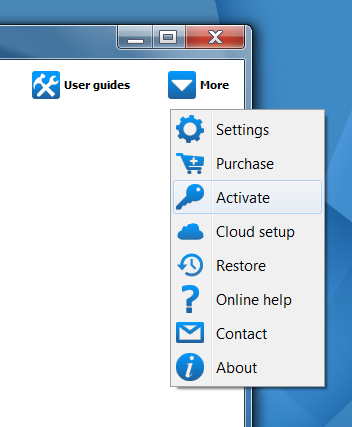 Close the pop-up window and go to “More” and then choose Activate. The pop up will be gone and you will see the familiar setting – your full name, last name, and the activation code. Re-enter the code. We strongly recommend you copy and paste all the data straight from the invoice, including your first and last name. 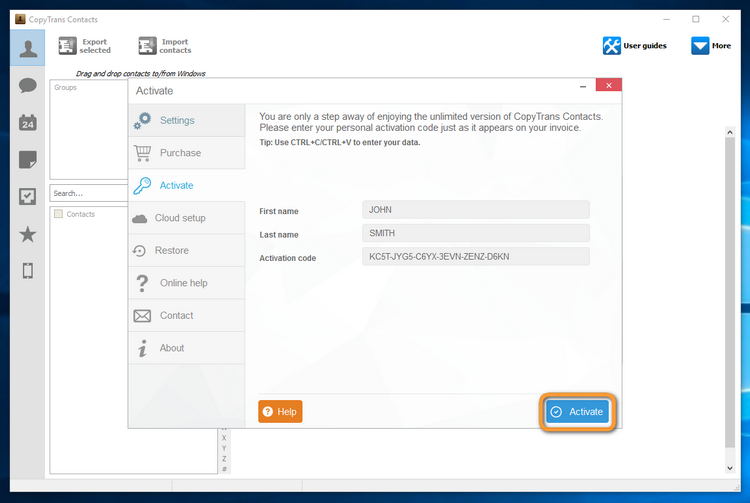 Tap on the Activate button and enjoy your full version of CopyTrans software. TIP: If it still doesn’t work it most likely means that the code has expired. But the good news is that you can prolong your license with a 30% discount. Head over to the license page to benefit from this offer. 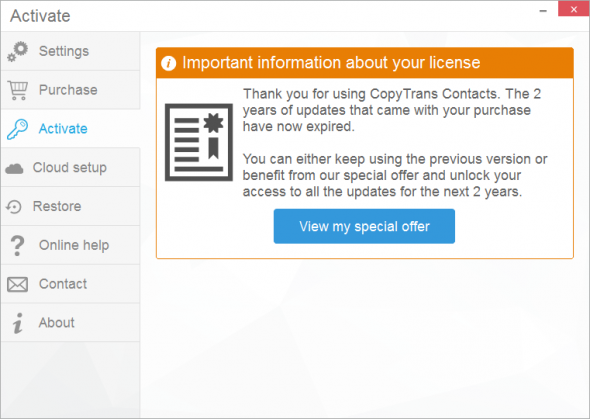 If you purchased CopyTrans license less than two years ago, your activation codes are still valid and you can benefit from using the latest version of the program. Please, reactivate your program. In case you have lost your activation code you can retrieve it on this page. An email with your activation details will land in your inbox within the next 5 minutes. 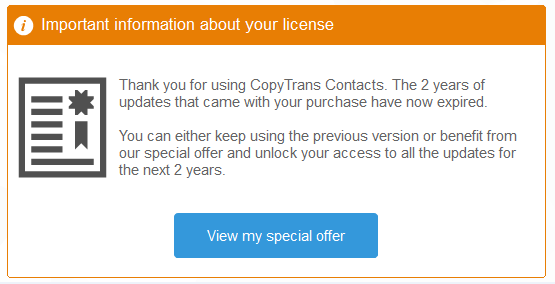 The above message means that your CopyTrans license is still valid (since it’s a lifetime license) but your two-year period of updates has expired. Now you can repurchase the codes or continue using the previous version. To update, just re-purchase the program. If you prefer using the older version, downgrade. If you are still having problems with the activation codes, please contact our Support Team directly.